In the spirit of acknowledging the resilience of the Indigenous Mi’kmaq people and their language, and in celebration of Mi’kmaq History month in Nova Scotia, the Faculty of Agriculture officially renamed River Road on the Agricultural Campus to “Sipu Awti” this past Monday October 17th, reflecting the literal Mi’kmaq translation of its name. 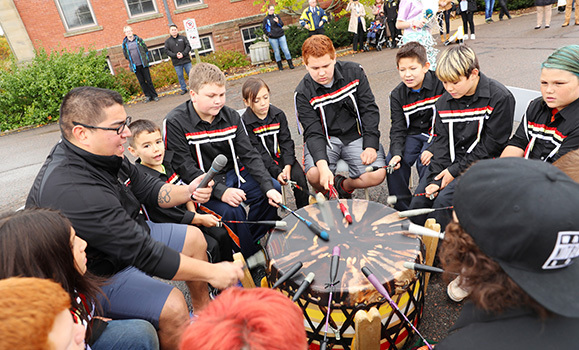 “By making this change we are furthering our efforts to be a welcoming and inclusive environment for all learners and one in which our indigenous students can see their community honoured and reflected,” explained Dean David Gray. The word Sipu, pronounced “see boo”, is the Mi’kmaq word for “river.” Rivers and water, as an element, are recognized by the Indigenous peoples as sacred and are linked to both physical and spiritual health. 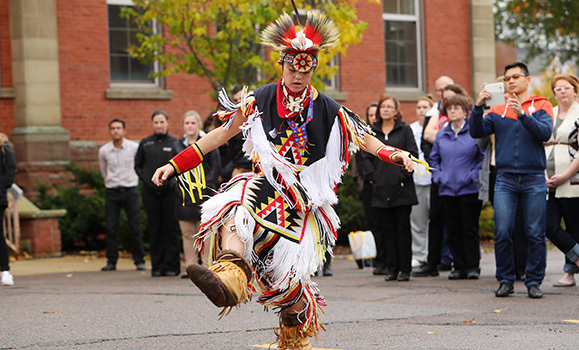 Mi’kmaq drumming group Samqwan Boyz and traditional and Fancy Shawl dancers performed while Elder Jane Abram from Millbrook First Nation who is also part of the Elders-in-Residence program on the Halifax Campus, performed an opening prayer. This is the second in a series of initiatives the Faculty of Agriculture has undertaken to acknowledge a shared history between Dalhousie University, the Faculty of Agriculture and the Millbrook First Nation community. This past June, the Mi’kmaq Grand Council Flag was permanently installed on the Agricultural Campus, acknowledging the campus sits on Traditional Territory of the indigenous Mi’kmaq people. The flag-raising was marked with a special ceremony in the Faculty’s Centennial Amphitheatre. The Faculty of Agriculture is also developing a series of co-curricular activities on campus with an aim of increasing Indigenous cultural awareness and inclusivity. The incorporation of Indigenous perspectives and ways of knowing in curriculum, policy and on campus landscapes will ensure administrators, faculty and staff have a broader understanding of Aboriginal culture, values, traditions and customs. (L to R) RCMP Cst. 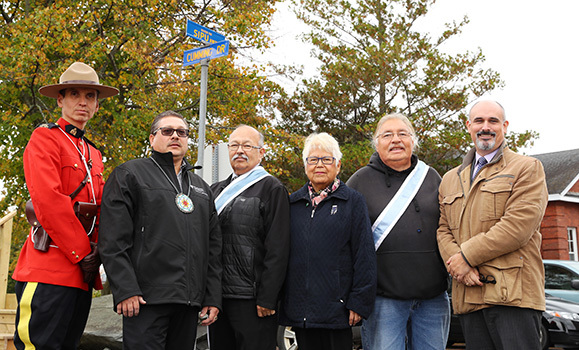 Corey Paul of the Millbrook detachment, Chief Robert Gloade, Dr. Donald Julien Executive Director Confederacy of Mainland Mi'kmaq, Elder Jane Abram, Russell Julien Grand Council member Sipekne'kati District and Dean David Gray.